Intended to post this earlier, but I sent this as an email to my brother Whit early Thursday, after our boys crushed Miami to punch a ticket to the NIT semifinals in Madison Square Garden. I'm re-posting here with a few updates. So what does all this mean? The temptation, even in the celebration of the moment Wednesday night, is to grumble, "Yeah but ... it's JUST THE NIT." And I guess it is. But it's more than that, right? • The 19-0 mark at home. A bigger deal than even I want to say. For all the talk about Alabama not being a basketball school — and yes, football will always come first — deep down we all know that basketball can thrive here. And the fans this season seemed to really love this team; even ESPN's announcers noticed that the students seemed to really encourage our guys on defense, and the boys feed off that energy. To see the standing ovations for Senario Hillman (a senior), hear the roar of the crowd during the crucial second-half run, see the team and the coach high-fiving everyone on their way off the floor, that DOES mean something. • The way the team played in the tournament. Be honest: this was an overachieving team pretty much from the jump. How could we have won 24 games with such a limited roster? The only answer: by sustaining a ridiculous level of intensity that our opponents couldn't totally match. And that was the danger after Selection Sunday: With no real title left to achieve, would that intensity level let down? We have our answer now: the New Mexico and Miami games were basketball exactly the way coach Grant envisioned it played. Turnovers, frenetic energy and a breakneck pace. One of the best compliments to a coach is that his team gets better when it matters, and Alabama has done so. That's pretty special. 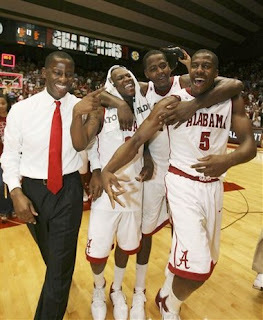 • Most importantly, the fact that Alabama basketball is on a big stage. Maybe basketball at Alabama never stopped mattering to people like you and me (true believers), but the program hasn't received this kind of exposure since the run to the Elite 8 in 2004. The only answer to being left out of the big tournament was for the squad to prove itself in the little one. And they have done so, with emphasis. And, with the news over the weekend that Jamychal Green intends to return in 2012, with Tony Mitchell and Trevor Releford coming into their own in March and a promising recruiting class coming down the pike, things are definitely trending upward. It's not a national championship, but it's a pretty big step. Roll Tide.